We specialise in creating stunning wall features. Glass splashbacks and glass feature walls, porcelain facades, exquisite timber walls and inserts, and Clipwall digital imaging panels. We can create a space that appears to have no walls; full of life and colour that can transport you to wherever you want to be. A rainforest, the outback, the beach, we can create your desire. Feature walls made of glass, timber, porcelain facades and creative inventiveness of textural and tangible materials to make a beautiful space where you will want to be; for your home or business. Incorporating personalised images; we can make your personal space one of a kind. Corporate branding steps into a new world where you can make your mark in outstanding style. Browse our design pages and Let us Inspire you! 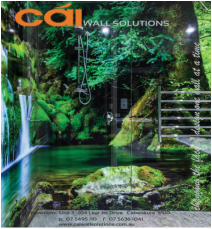 With decades of experience, creative talent, passion and dedication to the industry, the experienced team at Cai Wall Solutions are driven to deliver a personalised service to every client that invites them into their home, office or business. you can live, work and play. Providing you with professional advice and quality service, our team instinctively recreate residential spaces that are designed for you and your family; or a business or commercial premises in a completely unique way. From traditional to contemporary styling; from vivid to minimalistic designs, we fuse personality and practicality to great effect. ﻿Although the northern suburbs of Brisbane may be our home, our team of professionals travel further afield to service clients in the southeast corner of Queensland from the Gold Coast to the Sunshine Coast, we have designed countless feature walls and glass splashbacks, for homes and commercial businesses in coastal regions, rural towns and metropolitan areas. We take great pride in the fact that most of the projects that we undertake come from referrals and existing clients, providing reassurance of our service and quality and reinforcing our commitment to establishing long-term relationships with each and every client. Our Values It's important to us to work with integrity across all that we do, the way we conduct ourselves, the integrity of the materials we work with, and how we deliver the final product to you. This we do while embracing Our Values. Creative and imaginative ideas delivering unique wall solutions. Stunning feature walls, glass splashbacks and creative improvisation of materials that we translate to reflect you and who you are in your home or business. Consistent service and dependability are the core of Cai Wall Solutions; every member of our team is accountable and we keep you informed every step of the way. Competitive pricing using the highest grade products and the latest stylish concepts, working together our team deliver up to the moment designs to work within your agreed budget.